Iranian Foreign Minister Javad Zarif answers questions during a press conference after meeting with China’s Foreign Minister Wang Yi in Beijing, September 15, 2015. The Trump Administration’s chaotic foreign policy presents a buffet of opportunities to Beijing. When the U.S. disappoints well established expectations or absents itself from international leadership, China can decide to step in opportunistically or to stay aloof. There are only a handful of issues, like North Korea, where China is inherently engaged. Even with its “all weather friend,” Pakistan, China can generally stay out of thorny problems. Iran is not part of China’s immediate neighborhood, but China is inescapably part of the Iranian security challenge. Like a traditional great power, Chinese inaction on Iran will be as much a policy decision as action. 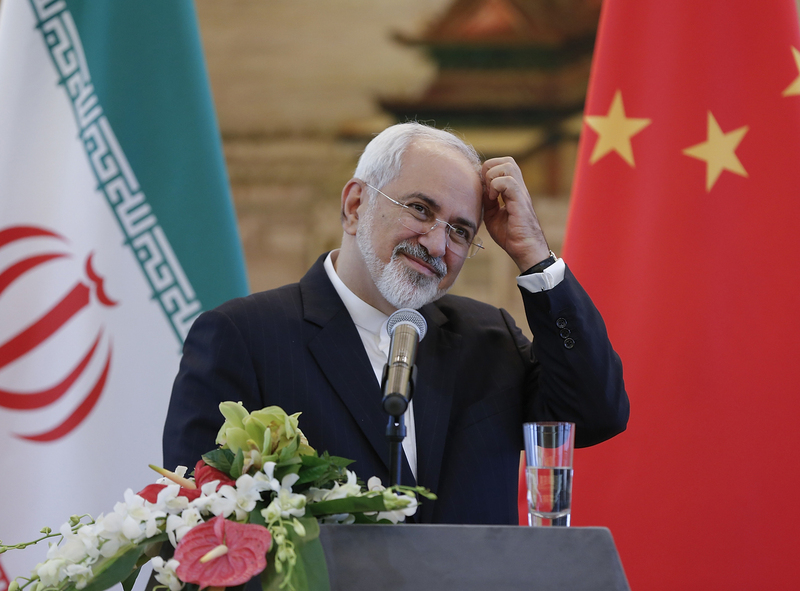 China was essential to striking a nuclear deal with Iran. First, they were a real (if occasionally reluctant) partner in building pressure on Tehran. Beijing voted for six U.N. Security Council resolutions targeting Iran between 2006 and 2010, and China’s oil imports from Iran fell by more than 20 percent in 2012-2013, when the U.S. was mounting its strangulating sanctions campaign. As Iran’s largest oil customer, Chinese cooperation was essential to the effort. China was then critical to structuring the Joint Comprehensive Plan of Action (JCPOA). China is now almost certainly in a position to save a rump version of the JCPOA after the U.S. withdrawal. How? First, China would need to join Europe and Russia in demonstrating that for the first time since the Islamic Revolution, Washington, not Tehran, finds itself isolated. Second, China would need to sustain cooperation with Iran on civil nuclear projects. China has been cautious as Iran’s main partner in rebuilding the Arak heavy water reactor, not wanting to get ahead of the U.S., but now it would need to take political comfort from a more complex coalition. Continued negotiations over power reactors and cooperation on scientific or regulatory issues also matter. Any nuclear cooperation means risking U.S. sanctions—and the complications they can create for China’s commercial nuclear ambitions—to allow Iran to continue to enjoy the benefits of the deal, and so has both political and technical meaning to Tehran. The most difficult and most important challenge is for China to reverse its 2012-2013 position on oil purchases. Close U.S. allies and economies deeply bound to the U.S. are likely to reduce imports enough to push Iran into recession—and out of the deal—unless China increases imports to partially absorb sales lost to sanctions. That is possible, but it would force a clear standoff with the U.S. with economic and political implications. China will either decide to save the JCPOA or not, but it cannot duck the responsibility of the choice. How Beijing approaches this challenge will obviously be important to the international non-proliferation regime and to Middle East stability, but it will also be instructive for China watchers to see how Beijing wrestles with a policy problem far from home when it is a part of, rather than apart from, the issue. Beijing doesn’t want war, violent regime change, or nuclear weapons in Iran. It needs to secure and diversify its energy supplies, and instability in the Middle East threatens that. So, China seeks to preserve the Joint Comprehensive Plan of Action (JCPOA) and says it will maintain normal relations, presumably including energy supply contracts and partnering through the Belt and Road Initiative. The lifeblood of the relationship is the 600,000-700,000 barrels of oil Iran ships to China daily. Tehran wants its key customers there to keep buying, even after the re-imposition of U.S. sanctions. Additionally, over 100 Chinese companies are active in Iran, primarily in energy, infrastructure, rail, and automobiles. Trade and investment have been growing strongly for more than a decade, turning China into Iran’s leading economic partner. U.S. sanctions and other aggressive moves will increase risks to business and probably stall much of this economic engagement. Washington has indicated it will ban settlement of transactions with Iran in dollars and wants oil imports from Iran to go to zero by November. The measures it is threatening cover shipping, insurance, finance, and logistics. Chinese companies that don’t comply risk being shut out of U.S. banks and capital markets, and will likely be mindful of ZTE’s recent high-profile punishment. Beijing may quietly issue warnings, but is unlikely to intervene to protect most of them. Would Trump really sanction China’s big banks and energy companies? Do they have the appetite to risk finding out? And how would Xi respond? CNPC, Sinopec, and CNOOC are vulnerable because they or their subsidiaries trade shares in New York. They may try to reduce imports from Iran and seek alternatives. Investments are a more complicated problem. CNPC has a 30 percent share of a joint venture with Iran’s PetroPars and France’s Total to develop the South Pars gas field. Total may have to pull out. CNPC could take over its share, but that’s uncertain. It lacks Total’s technical capacity for offshore exploration and will probably have to wait. Some Chinese companies may do barter deals, settle accounts in renminbi on the Shanghai International Energy Exchange, create subsidiaries, or conduct transactions through Bank of Kunlun, which doesn’t do business with Americans. Enterprises that are not exposed, particularly small and medium-sized ones, might find market opportunities due to reduced competition, but could suffer if Iran faces upheaval. Diplomatically, Beijing is sure to decry unilateral American measures, but it’s unlikely to confront Washington over them. The two already have a full agenda of sticky issues to discuss, and unlike North Korea, Iran won’t make it to the top unless Trump puts it there or Xi becomes genuinely worried about a war. Instead, China probably will continue looking to Europe to take the lead in finding solutions or negotiating workarounds that it can support. Trump could offer to resolve the trade war if Beijing helps bring the Iranian regime to its knees, but China would be reluctant to help the U.S. regain dominance over the only country in the region with rich hydrocarbon resources in which Americans lack a foothold. Instead, expect Chinese players to create and widen loopholes to maintain ties with Tehran without overly provoking Washington. Beijing’s reactions to rising tensions between the U.S. and Iran have been quite predictable, and this latest development is unlikely to cause a sudden shift in China-Iran relations. China maintains its commitment to the nuclear deal, is unlikely to implement proposed U.S. sanctions, and will continue to balance its relationships with rival states in the Middle East without necessarily being “sucked into” political hostilities. In response to Trump’s late-night, all-caps tweet, a Chinese Foreign Ministry spokesperson simply called on the U.S. and Iran to “resolve disputes and issues through dialogue and consultation.” This is the standard Ministry of Foreign Affairs response to any diplomatic tension, and will remain so. On May 9, the day Trump issued his executive order withdrawing from the Iran nuclear deal, Beijing expressed its ongoing commitment to “upholding and implementing the agreement with an objective, fair, and responsible attitude.” China is invested in holding to the deal, the result of years of negotiations with the “P5+1” (of which it is a member) and the EU. Inked in 2015, it was seen as an important regional stabilizer in aid of its Belt and Road Initiative, in addition to its securing of oil supplies. China has thus far been adept at balancing its relations with rival states in the region. For example, following the Saudi-led blockade of Qatar beginning last June, China arguably played a crucial role in the small Gulf state’s economic recovery, building one of its main World Cup stadiums and increasing two-way trade by 36 percent. Saudi Arabia is also hardly on friendly terms with Iran. Nevertheless, it hasn’t shunned China: Earlier in July, Saudi Foreign Minister Adel bin Ahmed Al-Jubeir called China an “important strategic partner” and said both countries would “enhance the alignment between the Vision 2030 of Saudi Arabia and the Belt and Road Initiative.” Despite the United Arab Emirates’ fraught relationship with Iran, it too has been courting China. But China is not completely uncritical of Iran. Earlier this month, Beijing rebuked Iran when, in response to proposed U.S. sanctions, it threatened to close the Strait of Hormuz—a strategically critical port for China’s oil imports from the Middle East. China will protect its economic interests, regardless of who makes the next move. On a radio call-in program in Beijing in early 2015, several months prior to the conclusion of the Iran nuclear deal, or Joint Comprehensive Plan of Action (JCPOA), China’s ex-Ambassador to Iran Hua Liming explained to nationalist-minded callers why China should not simply stand aside and let U.S. arrogance and aggression bog the United States in yet another Middle East war. The program was sponsored by China’s Ministry of Foreign Affairs and was part of the government’s effort to mobilize popular support for potentially unpopular foreign policy moves. Hua explained why a war between Iran and the United States would injure a number of Chinese interests, and why, consequently, China was supporting the effort to achieve a negotiated compromise settlement of the Iran nuclear issue. An Iran-China war would, Hua explained, shut off the flow of oil from the Gulf on which China’s and the world economy depended. Global economic recession was the probable result. China’s economy would suffer. Such a war would probably protract and escalate, destabilizing the region. Refugees and radicalized youth would increase tension. Public security problems in Xinjiang would worsen. China’s enterprises in the Gulf, including those associated with Belt and Road projects would suffer. The peaceful settlement of the Iran nuclear issue would open the door to greatly expanded China-Iran economic cooperation. War would keep those doors closed. Nationalist-minded callers to Ambassador Hua’s call-in program disagreed. As their frequently pointed “questions” to Hua made clear, bogging the United States down in another war in the Middle East would weaken U.S. national will and treasure to China’s advantage. A U.S.-style war would cause immense suffering, anger, and resentment, further undermining U.S. claims to moral superiority. Americans would tire of the burden of sustaining ungrateful allies. Eventually they would tire of the heavy burdens of empire, and go home. Hua’s view won out with China’s leaders, persuading them to support the Iranian-U.S. quest for a negotiated settlement to the nuclear issue. China adopted a previously unprecedented mediation effort, working in tandem with the United States to persuade Tehran to make the concessions necessary to shelve that issue. Now, Beijing will be loath to abandon the product of its unprecedented effort to mediate the U.S.-Iran conflict. But if war does come, China will find significant diplomatic opportunities. It is unlikely to materially support Tehran against Washington, but it could well align with Russia and India to form a sympathetic front. A U.S.-Iran war would drive a wedge between India and the United States—a major Chinese objective in the new “great game.” India sees Iran as an important partner in countering Pakistan/ Taliban influence in Afghanistan, opening links to Central Asia, and managing the “rise” of China in the Indian Ocean region. A hostile Iran could also cause domestic stability problems for India. India would be loath to follow the U.S. down the path to war with Iran. Uncoupling India from the United States would be a major strategic gain for China. Trump’s tweet set off a barrage of heated discussions on long-standing U.S. regime change policy toward the Middle East, with some pundits such as retired Army Colonel Douglas Macgregor predicting a possible war with Iran that could draw in China and Russia. Indeed, China has large stakes in Iran’s stability. It is the largest buyer of Iranian oil, and its largest trading partner, while Iran is a key strategic node connecting Asia and the Middle East on the Belt and Road Initiative (BRI). Additionally, after decades of overthrown governments precipitating failed states and rising terrorism, China is against further Western-sponsored regime change in the region. According to Sinologist John Garver, China’s proactive efforts in negotiating the Iran nuclear deal and peacemaking diplomacy in the Mideast is to prevent Iran’s collapse. China learned a harsh lesson from Iraq’s experience, which was transformed from a major regional power in the 1980s to a failed and fragmented state due to two lost wars with the U.S., in 1991 and 2003. Chinese strategists realize a war between the U.S. and Iran would leave the country in ruins and destabilize the entire Persian Gulf, threaten China’s access to energy sources for continued economic growth that undergirds the Communist Party’s legitimacy, jeopardize its flagship BRI project the China-Pakistan Economic Corridor by the Strait of Hormuz, and expand a larger swath of ungoverned space in the greater Middle East for terrorist actors to thrive. As such, it is important for leaders in Washington not to deny agency to regional powers—be it China, Russia, or India—and to realize others actors also have red lines and legitimate security interests. For example, former Indian Ambassador to Turkey M. K. Bhadrakumar is already pushing back, stating that Indian ties with Iran are a “sovereign prerogative,” and that energy security, rather than “America First,” should be their priority. Likewise, the EU does not support U.S. policy and is scrambling to save the Iran nuclear deal and be exempt from new sanctions. Already reeling from the refugee crisis, the EU does not want another war in the Middle East. At the center of U.S.-Iran tension is the issue of Israeli security and Iranian presence in Syria. If the U.S., China, Russia, and other great powers can negotiate a deal in Syria that meets Israel’s security without sacrificing key stakeholders’ legitimate interests, perhaps people in Syria and the wider region will finally have a chance to exit the war economy and rebuild their countries. But should the U.S. choose war, then just as attacks on Syria drew in Russia and Iran, the wild card is that an attack on Iran may ultimately draw in China. The Trump administration’s recent rhetoric threatening Iran will have positive ramifications for the China-Iran relationship because it further delegitimizes the role of the United States as a peace-broker in the region, a role that, increasingly, China is embracing. Iran needs a peace-broker to help it during this dire time for its economy. Iran needs to be at peace with its neighbors to join the local process of regional economic integration. Iran’s regional integration is both important for its own economy and for the success of China’s Belt and Road Initiative, which also revives China’s civilizational diplomacy with other countries, including Iran. In addition, Iran needs to maintain economic ties with Europe and China. Europe and China are engaged in trade wars with the U.S., and this creates an opportunity for China, Iran, and Europe to build international cooperation. China through its quasi-mediation diplomacy, in which it defends its commercial, political, and diplomatic interests rather than focusing solely on security and strategic interests, can allow Iran to strengthen its economy even in the face of the re-imposition of U.S. sanctions. The U.S. has been losing credibility as a helpful player in the internal and regional conflicts of the greater Middle East since the Arab Spring. China’s support for non-interventionism accords with the needs of both leaders and people in the greater Middle East, and has made China a more respected partner for countries from Morocco to Pakistan. The symbolism of Chinese President Xi Jinping’s multiple visits to the Global South have projected care for countries seldom visited by leaders of powerful nations. This should not be discounted. Ten months ago, Trump engaged in a war of words with North Korean leader Kim Jong-un, raising concerns of an outbreak of violence. But then instead of going to war, the two exchanged friendly smiles and handshakes in Singapore. Similarly, this recent war of words with Iranian President Hassan Rouhani could be Trump’s attempt to exhaust the hostile feelings of a foreign opponent, wipe the slate clean, and then rebuild the U.S.-Iran relationship. This is the best case scenario. The worst case, of course, is that Trump’s statement was a prelude to war. In this case, China now has a greater incentive to side with Iran than with its trade opponent, the U.S.
Trump’s tone-raising when addressing Iran could be symptomatic of an alleged strategy of getting elected for a second term, a strategy he reproached to Obama back in 2011. This seems to be a paradoxical move, but we became used to such paradoxes in the current political landscape. French President Emmanuel Macron recently took full responsibility over a scandal involving his bodyguard, which felt like a nice change from our current scene of obnoxious high officials’ reactions. I look forward to more of such positive changes: for instance, the U.S. and Iranian presidents taking more responsibility for the mother of all problems, the failing economic system.